Miguel Adames was one of the first RIT students to enroll at American University in Kosovo, which opened in 2003 and is affiliated with RIT. “It was an experience I will never forget,” he says. 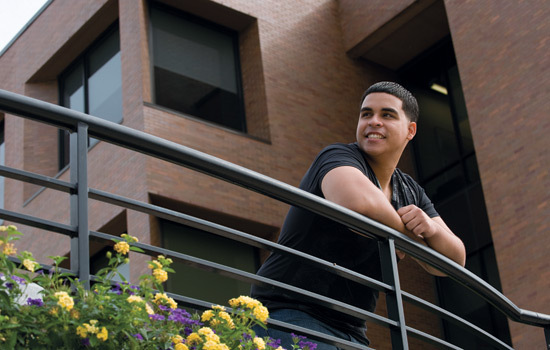 Miguel Adames always wanted to study abroad and had heard about opportunities for RIT students in Dubrovnik, Croatia. But his advisor suggested he think about studying at the American University of Kosovo in Pristina, which is affiliated with RIT. “I knew nothing about Kosovo,” says Adames, a fourth-year international studies and applied arts and sciences double major. But Adames did some research and in the spring quarter became one of the first RIT students to enroll at American University in Kosovo. Meanwhile, Diellza Gashi, Etida Zeka and Nita Abrashi had finished their undergraduate degrees at the American University of Kosovo in 2009 and were interested in pursuing master’s degrees in the United States. They graduated with MBAs from RIT this year. Now more than ever, international students are choosing to study at RIT and RIT students are spending time learning in other countries. This academic year, 1,673 international students are on campus, up from 1,082 in 2000 and more than double the number in 1996. More than half of those students are pursuing graduate degrees. Jim Miller, senior vice president for Enrollment Management and Career Services, says RIT distinguishes itself on global initiatives because the university has partnerships in place to bring students to RIT as well as global campuses in Kosovo, Dubai and Croatia and relationships with the Dominican Republic and Turkey to give students an international experience. Students also can study abroad through programs at universities affiliated with RIT or even work abroad. Increasing student participation in global initiatives is a key component of RIT’s strategic plan, says Jeremy Haefner, senior vice president for Academic Affairs and provost. The New Jersey native hopes to return to Kosovo some day or study at American College of Management and Technology in Croatia, founded in 1997, or RIT Dubai, which began offering graduate classes in the fall of 2008 and undergraduate classes this year. This academic year, 1,179 students are studying at RIT’s international sites and 231 more are studying abroad through other programs. Haefner says few universities can boast that they have global campuses. These campuses are important because students in programs with few electives may find it difficult to study abroad without falling behind. But by offering the same programs in Dubai, Kosovo and Croatia, students can have an international experience while taking required courses from RIT faculty. According to RIT President Bill Destler’s goals and progress report, RIT hopes to have 1,700 students enrolled in global campuses and 350 students participating in other study abroad programs by 2013. In addition, RIT plans to market the global campuses to other colleges with the goal of having 100 non-RIT students study abroad annually at these campuses by 2013, Haefner says. Nationwide, more students are participating in study abroad programs. 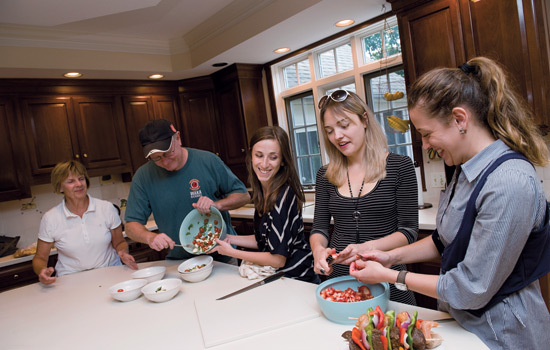 The number of Americans studying abroad increased by 8.5 percent to 262,416 in the 2007-08 academic year, according to the 2009 Open Doors report by the Institute of International Education. Four times as many U.S. students participated in study abroad in 2007-08 than in 1987-88. Bob Barbato, a professor of management in the E. Philip Saunders College of Business, says teaching at American University in Kosovo was one of the most rewarding experiences in his 30-year career. He taught business ethics to undergraduate students during the 2008-09 winter quarter. While there, Barbato identified Gashi, Zeka and Abrashi as strong students and talked to them about studying in Rochester. They were skeptical at first. They worried about the high cost of tuition and wondered how they would be able to afford living expenses. But Barbato helped them get a scholarship to attend RIT and hosted the students in his home. By August 2009, the women were in Rochester. They took four courses a quarter and graduated last May with their MBAs. They returned to Kosovo in late August. Jeffrey Cox, director of international student services, says international students this year came from 113 different countries. The biggest growth has been from China, India, Saudi Arabia and the Dominican Republic. China, for example, grew 34 percent to 264 students this fall. And 573 students came from India, up 6 percent from last year. Diane Ellison, assistant vice president for Part-time and Graduate Enrollment Services, says RIT has a strong reputation in these countries. Her office works with government agencies and international organizations to recruit these students to RIT. She says the next step is to attract more international students at the undergraduate level and continue to leverage the partnerships RIT already has to give more students international opportunities. “Our greatest selling point is that people leave here very happy,” Ellison says. The women became part of the Barbato family, living in his grown daughters’ rooms and eating dinner with Barbato and his wife, Linda, on Sunday nights. Abrashi added that the degree from RIT will open doors for them in Kosovo, a country that is rebuilding after declaring its independence in 2008. The average age there is about 25. Barbato, who also taught at RIT Dubai, says that studying abroad is an experience that should be expected as part of a college education. That is certainly true for Adames, who hopes to one day work for a government agency or a non-profit organization. In the meantime, he created a slideshow of his time in Kosovo to generate excitement among other students.